Just a placeholder for now. I will be updating related info on the first page once they are avaliable. Quest 3: Catch 30 saury. Rewards are one from 2016 saury flag/ 2017 saury flag/GFCS MK.37, and the new saury flag. Last edited by 211303; 10-11-2018 at 07:07 PM. Second quest wants 10 fish so that'll take a while. Last edited by Murrue; 10-10-2018 at 12:57 PM. So I have 6xWG42 and 3xNOAP (2 normal +1 skilled). What should I pick from the 2nd quest? Six WG42 should be enough, though you can sometimes double up. Should have plenty of NOAP, especially since the limit is really on NB planes. So simple decision IMO - get the 2x RE (reinforcement expansions). Can always use those. That's what I'm going to pick. @Danielosama NOAP is useless as you will not have enough night plane to equip 3 CV, let alone 4. Minimal chance for it to become fodder as well since it is not farmable. 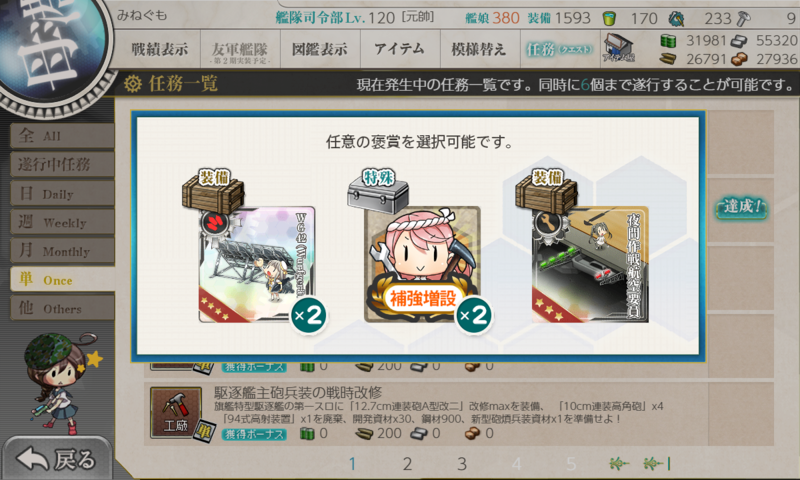 Therefore, it's a toss up between WG42 (additional firepower in some setup), and RE (1000 yen). Swordfish doesn't really count due to the extremely low amount of firepower they provide at night. Realistically, night cv are quite worthless without TBM, so we could only field one practical night cv at a time for now.